Triangle Hobby Ranch - Triangle Hobby Ranch Lowline Classic Cattle in central North Dakota specializing in compact cattle including Belted Lowline and White Park (British White) cattle that anyone can raise for their own clean grass fed beef. Specializing in an all purpose hobby farm cow. We strive for meat, milk, size, and temperament. By utilizing breeds such as American Aberdeen and White Park, we can achieve a superior classic sized animal that is grass efficient AND beautiful to look at. See below. 2018 Calves are on the Sales Barn Page! This heifer is from an Aberdeen bull bred to a White Park cow. She raised an outstanding calf as a heifer. Super milking traits. Greetings from east central North Dakota. Thank you for stopping in. We are producing healthy, easy to handle cattle so that we can feed our family... and hopefully yours! We are raising cattle that nearly anyone can raise... you don't need big fancy equipment or a lot of land. That's why we keep our cattle a manageable size. We try to keep our cows from 800 to 1000 pounds and bulls around 1000 pounds. Their height is usually armpit level at max. 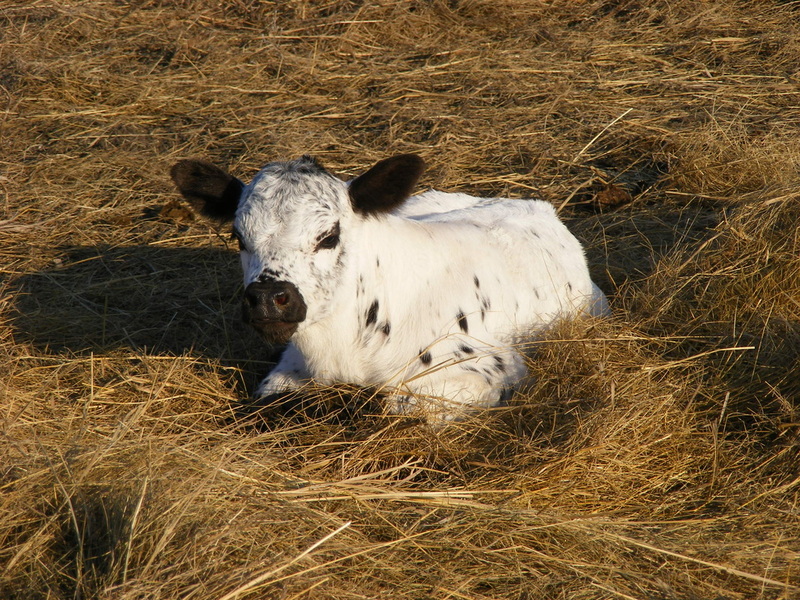 Calves are born anywhere from 40 to 60 pounds at birth and wean around 400-600 pounds at 6 months of age. We have added some Moderator Aberdeen Angus to our herd which has increased our weaning weights! (You can see the size of a calf near weaning age below next to her mother.) Our cattle eat treats out of our hand and are really easy going. They are bred to be able to keep their condition during our long, frigid North Dakota winters, as well as our hot summers. Also we don't want to feed our kids beef that has been filled full of hormones and then pushed feed to make the animal achieve market weight as fast as possible. That's not clean meat to me. Our cattle are raised on grass and hay. They do not receive any hormones or antibiotics. We are always happy to answer any questions you might have of us or the cows. Please give us a call or email us with the info on our contact page. Why do we raise these breeds??.... here is a brief description as to why we raise the breeds we do. American Aberdeen... red or black....formerly known as the Lowline or Lowline Angus. They are compact in size, easy to work with, super fleshy and stocky. throw nice low birthweight calves, so our cows never need assistance calving. The Aberdeen Angus will wean calves just as large as conventional breeds however they require less acres since they eat less than a conventional cow. Moderator Aberdeen Angus... these are Aberdeens crossed with another breed of cattle. Moderators are becoming very popular as a way to reduce the size of your herd cow. They offer the grass efficiency of the Aberdeen with the more conventional look of a typical cow. This is a great way to improve genetics in your herd. White Park and British White... British White are polled, White Park have horns. We have bred a lot of the horns away but still like to keep a few in the herd. Make great watch cows against predators like coyotes. 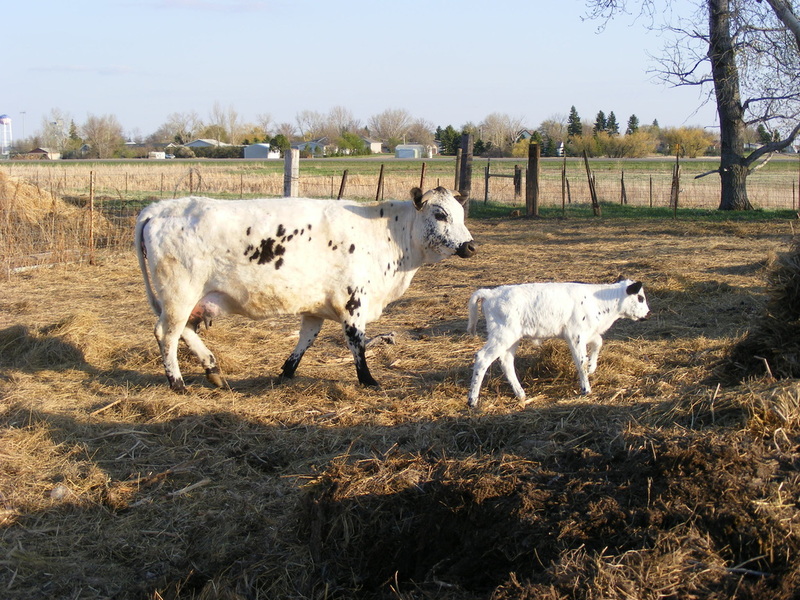 White Park/British White's are excellent mothers! White Park can serve as a dual purpose beef & milk producing cow. Many have enough milk to be your family milk cow. Easy to work with cattle. Gentle and beautiful.